The zebra, with their unique striped coats, is one of the most iconic of all of Africa's grazing animals. They are social animals that live in groups ranging from small harems to large herds. The most common of the three extant species is the plains zebra, which roams grasslands and woodland of eastern and southern Africa. 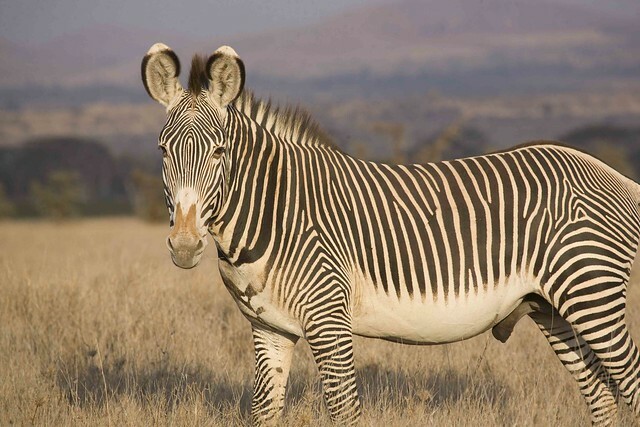 In contrast, the Grévy's zebra, found in dry, semi-desert areas of Kenya and Ethiopia, and the mountain zebra, native to mountainous and hilly habitats in Namibia, Angola and South Africa - are both endangered. The zebra’s stripes have been proven to reduce the amount of insect bites an individual receives compared to animals with a single fur colour. The effectiveness of the stripes has been picked up on by tribal people living in similar regions who have learned to paint their bodies similarly to prevent insect bites and avoid disease. As the unique stripes provide an individual marker for each zebra, they also play a key role in individual recognition, with zebras being able to recognise individuals and remember the relationships they have had with those individuals over time. This is particularly important for animals which live in such large numbers. Each year, zebras are part of one of the most spectacular sights in the animal kingdom, as thousands migrate in turn with the seasons between foraging grounds in search of new food sources. For many years it had been assumed that these migrations were based on the availability of resources, but recent research has shown the dominating factor in such movements may in fact be based on memory. 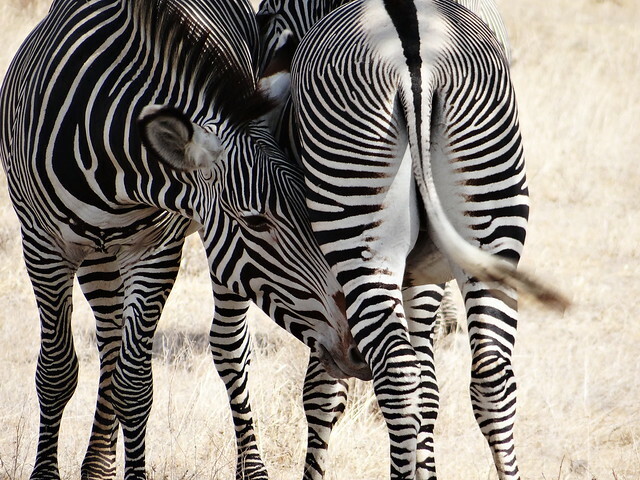 Zebras appear to migrate to the location where foraging conditions were best in the past. They navigate to their destination based on memory. Researchers modelled migration routes of zebras using computer simulations. Zebras migrate around 250 kilometers from the Okavango Delta, Botswana to the Makgadikgadi grasslands in November. They tested two mechanisms which can influence the direction. Simulated zebras could use perception and sense, for example, the vegetation in their current surroundings. Alternatively, zebras could use memory of previous migrations to forecast where to go. The researchers compared the simulated tracks with real-life tracks from GPS-tagged zebras which were collected by other researchers. Memory using past average conditions was able to predict the migration destination of the model. 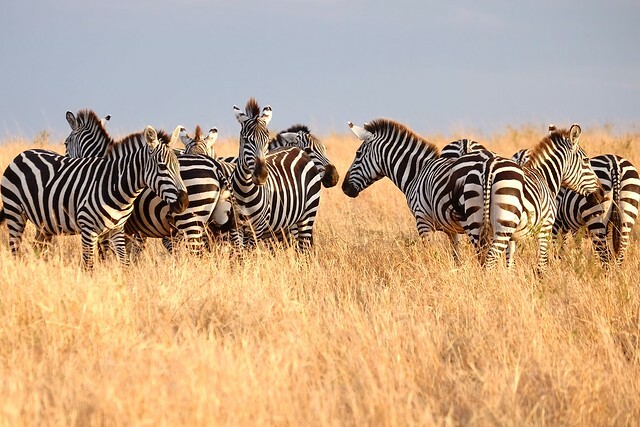 Perception is still important and studies have shown that perception of current local conditions plays a key role in the timing and speed of the zebra migration, but it appears that these may be less important for zebras than memory for deciding direction. This use of memory as a key driver means the species could be far more inflexible than previously thought. With migration routes increasingly threatened by land use and climate change, the animals’ memories could become a burden leading them to foraging grounds which no longer exist. The Grévy's zebra is at particular risk. With just 3,000 individuals left, the population’s small size means environmental hazards, such as drought, are capable of affecting the survival of the entire species.